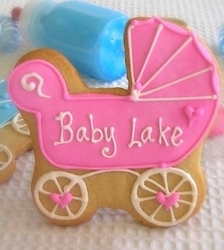 Our BABY CARRIAGE Cookie Favors are simply adorable! Just look at that detail! These beautiful hand decorated Custom COOKIES taste just as good as they look! Baby Shower Cookies are a delicious and fun way to celebrate a Baby Shower. These delicious butter cookie favors, frosted with royal icing that dries to a sweet crunchy topping, will tickle your fancy and your taste buds. These are scrumptious classic butter cookies with just a hint of almond that makes them delicious and tender. All baby shower cookies come in cellophane and curling ribbon.